Mary Jane Maffini and Barbara Fradkin, will be here Sunday the 13th from 2 to 4pm to sign copies of their latest mystery titles. 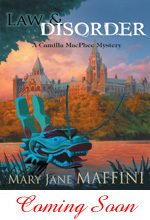 “Law and Disorder” by Mary Jane Maffini, is the sixth book in the series featuring Ottawa sleuth Camilla MacPhee. “This Thing of Darkness” by Barbara Fradkin, the latest in her Inspector Green series, also set in Ottawa.